Our son just finished his second week back at school. We're still getting into the swing of things. All day school is pretty rough on a four-year-old who still needs a nap, but we'll get there. Since he is currently taking his much-needed post-school nap right now, I thought I better round up the school traditions we started this year, so I can remember to keep up with them next year! 1. Celebrate Plate. We kicked off a new family tradition last week with our "Celebrate Plate." It's a way of marking special days and milestones. 2. Annual "Class of" Shirt. Take a picture of your child at the beginning of each school year to see how he (or she) grows into the shirt. 3. Lunch Box Note. I wrote a pretty basic note, but these free printables from A Little Clairification are adorable. 4. First Day Photo. I took the obligatory first day of school photo in front of our new purple door with D holding a free printable from Yellow Bliss Road. 5. Growing Up Gallery. I made a special photo gallery to showcase D's school photos. I actually started with a photo of myself a few weeks before D was born. I put up all the frames when I designed the layout so that it is a piece of art in progress. 6. Lunch List. One of our son's responsibilities is to pack his own school lunch. I made this free printable as a guide for him to make sure he packs everything he needs. 7. Driveway Message. Art is not my strong suit, but it was fun to write a welcome home message for D to see when he arrived home that first day. 8. New Year Interview. Each year we do a written and video interview on D's birthday. This year we started using these slightly different questions from Precious Designs for the new school year. The written version of D's back to school interview goes in the frame behind his school picture in his growing up gallery. Thanks to Pinterest, there are a ton of great back to school ideas out there. 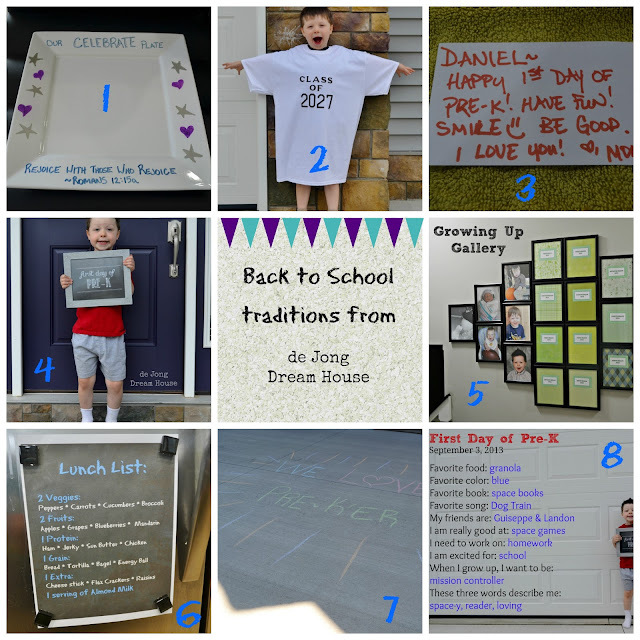 How to you celebrate back to school with your family?